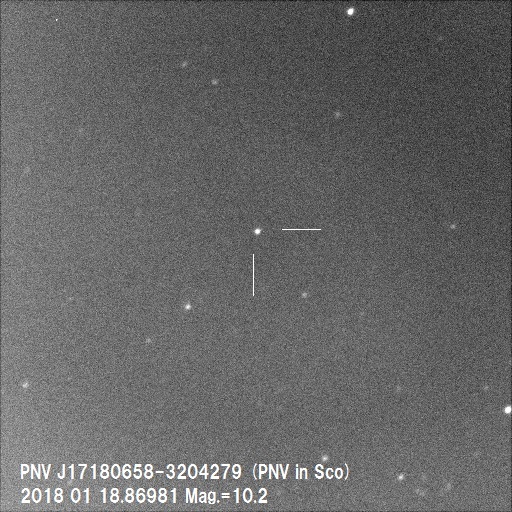 Spectra: Spectroscopy indicating that PNV J17180658-3204279 is a classical Fe II-type nova was obtained on 2018 on January 21.36 UT by J. Strader et al. (Michigan State), using the 4.1-m Southern Astrophysical Research Telscope (+ Goodman spectrograph) at Cerro Pachon, Chile (ATel #11209; reported in CBET 4481). Observing recommendations: Observations of all types (visual, CCD, DSLR, spectroscopy) and multiple bands (BVI in particular) as instrumentation permits are strongly encouraged as the nova evolves. Charts: Charts with a comparison star sequence for Nova Sco 2018 may be created using the AAVSO Variable Star Plotter (VSP). Submit observations: Please submit observations to the AAVSO International Database using the name NOVA SCO 2018. Once a GCVS name is announced in an IAU Circular or CBET, please use that name. Nova Sco 2018 is the topic of the AAVSO Time Sensitive Alerts forum thread https://www.aavso.org/pnv-j17180658-3204279-possible-nova-110-mag-scorpius and the Novae forum thread https://www.aavso.org/pnv-j17180658-3204279-sco. a. Designated PNV J17180658-3204279 when posted to the IAU Central Bureau for Astronomical Telegrams Transient Object Confirmation Page (TOCP). Unless otherwise noted and except for observations reported to the AAVSO, the information in this Alert Notice is taken from IAU CBET 4481. Spectroscopy details are in ATel #11209.
b. P. Schmeer (Saarbruecken-Bischmisheim, Germany) reports that the closest Gaia DR1 source to Fidrich's position is 2.9" away at position end figures 06.24s, 25.4"; G magnitude 18.1); three Gaia DR1 sources (G magnitude 18-91) are within 6". Schmeer also reports that the VISTA variable VVV J171806.41-320427.16 is 0".8" away at position end figures 06.41s, 27.2"; mag 18). - H. Nishimura (2018 January 17.869 UT; discovery images): 06.58s, 27.9"
- T. Noguchi (2018 January 18.86981 UT, via Nakano) 06.44s, 28.6"
- R. Fidrich (2018 January 18.748 UT): 06.37s, 27.7"
Congratulations to Hideo Nishimura on his latest discovery!